Grand National winner Rule The World's owner Michael O'Leary says he does not see the need to make the nine-year-old defend the title. The 33-1 shot, ridden by 19-year-old David Mullins and trained by Mouse Morris, won at Aintree on Saturday. Rule The World had never claimed a victory over fences before - and has twice recovered from a cracked pelvis. 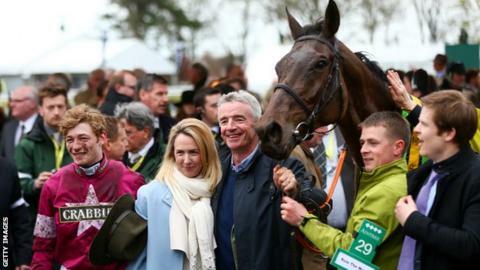 "I'd like to retire him if the trainer will let me," O'Leary, the boss of airline Ryanair, told Sportsweek. "The horse has just arrived home, had a roll and a big feed and we're taking him into Mullingar for a homecoming parade." O'Leary also won the Gold Cup at Cheltenham last month with Don Cossack. "The Grand National is the one that stops the nation in Britain and Ireland and it's an incredible privilege to win it," he added. "I still can't believe it's real. It feels like a dream, even one day later."